Home » News & Press » EU, Tax Me If You Can! 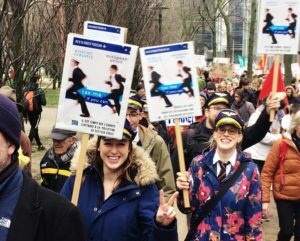 On Friday 15th of March, Carbon Market Watch took to the streets with more than 30,000 people as part of the Fridays for Future march in Brussels. The message on the streets was clear: Climate Action Right Now! Carbon Market Watch joined the action to raise awareness of a thorny topic recently retabled for debate among the EU Member States: aviation tax. The reason behind this is simple and logical: unlike other means of transport, airlines are not subject to a fuel tax on flights within, to or from the EU, even though aviation causes 5% of global warming. In Europe alone, pollution from aviation has increased by an alarming 10% between 2014 and 2017, demonstrating that what has been done until now to tackle this problem is nowhere near enough. The aviation sector is out of control. When it comes to pollution from planes, we are not just talking about CO2, which is bad enough as it accumulates and remains in the atmosphere for more than 100 years. In addition, the so-called “non-CO2 effects” act as a multiplier to aviation’s impact on the climate, e.g. the emission of gases such as NOx, which contributes to climate change through atmospheric reactions. As demand for air travel is expected to grow in the years to come, emissions from the aviation sector will consequently increase as well. By 2020, international aviation emissions are projected to grow by up to 70% compared to 2005, and the International Civil Aviation Organization (ICAO) forecast that they could grow by up to 300% by 2050. Such growth in emissions is not sustainable. Since 2012, CO2 emissions from air travel within the European Economic Area (EEA) have been regulated under the EU Emissions Trading System (EU ETS), but international flights are for now excluded. To cover growth in emissions from international flights, a global mechanism has been established: the Carbon Offsetting and Reduction Scheme for International Aviation (CORSIA), which will start in 2021 and only cover increase in emissions from then on, i.e. it will not tackle emissions up to prior levels. Due to its very weak climate goal and the objective of compensating emissions through offsets rather than actually reducing emissions, this mechanism is completely out of step with the temperature goals adopted to avoid catastrophic climate change. Amidst the continuing climate protests, the debate about aviation taxation is picking up speed again in Europe. A carbon tax would incentivize airlines and manufacturers to reduce the sector’s disastrous environmental impact. It would shift environmental costs from society at large to users while raising revenues that could be used to benefit citizens and climate friendly activities. Although EU Member States are free to tax domestic and intra-EU flights under the 2003 Energy Tax Directive, very few countries (including Germany, France, UK, Sweden) have done so, and only at a very low level. Belgium and The Netherlands have recently proposed a European tax on commercial aviation. In a note shared with their European colleagues, the Belgian delegation stated: “A fair and correct pricing of air transport is recommended with regards to its impact on the environment. There is currently no taxation on kerosene or VAT tickets. More environmentally-friendly modes of transport such as railways are more taxed than air transport”. There are several options to implement a tax on aviation, ranging from taxes on fuel to ticket taxes, or per flight taxes. Independently from national measures taken, a deeper and more transparent dialogue among the Member States or clearer guidelines directly from the European Commission are required to better harmonize a possible European aviation tax. EU, do you want to be a model for other regions? Take the lead, now. The aviation sector can achieve a faster and more environmental-friendly transformation, but it requires urgent and concrete actions. United European countries can play a key role in curbing Europe’s, and the world’s, growing climate impacts from aviation emissions while opening the path for further solutions and dialogues with other jurisdictions.